Mouse anti Human PAX2 antibody, clone 3C7 recognizes human Paired box protein Pax-2. Pax-2 is a 417 amino acid ~45 kDa nuclear protein critical to the development of the urinogential tract, eyes and CNS (Eccles et al. 2002). Mutations in the PAX2 gene can lead to deveolpment of Papillorenal syndrome (PAPRS) demonstrating both renal and ocular problems (Salomon et al. 2001, Higashide et al. 2005) or Focal segmental glomerulosclerosis 7 (FSGS7) showing segmental sclerosis of glomeruli (Barua et al. 2014). 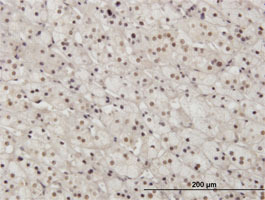 Recombinant protein corresponding to aa 194 - 304 of human PAX2.